We are the premier source for all versions of Plath's rarest sextants and have sourced and sold more unusual C. Plath sextants than anyone in the world! 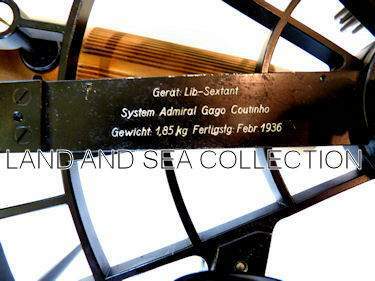 Presented is Serial Number 14401, a pristine example originally made to Admiral Gago Cutinho's design as an aircraft bubble sextant. 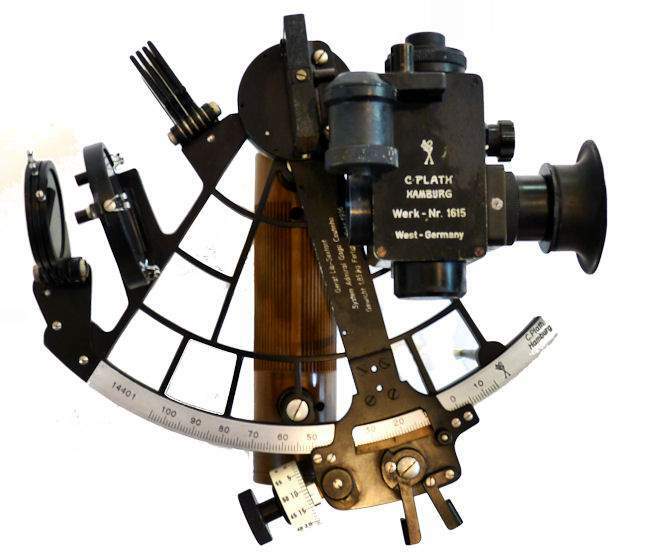 The sextant was introduced by Theodore Plath at the Berlin Airshow of 1930 under license from the Portuguese Navy, but was never sold in large quantities. C. Plath reports show only Lufthansa and Air France as being the major users prior to the outbreak of World War Two. Northrop Grumman Sperry Marine B.V. Hamburg, Germany, now the parent of C. Plath has informed us that Serial Number 14401 was originally made in January 1936, as a bubble sextant, and that later it was converted for marine navigation. The reason is unknown. Consequently, it is missing the artificial horizon attachment which would allow it to be used from an aircraft. However, it is complete in all other respects including the original round aluminum carrying case. This instrument in its present form is the equal of any “Collector Grade“ C. Plath “Classic“ with the added feature of being an especially rare instrument. Below is a Plath factory photo showing the triangular artificial bubble horizon attachment, and an earlier low powered telescope that was used in 1930. 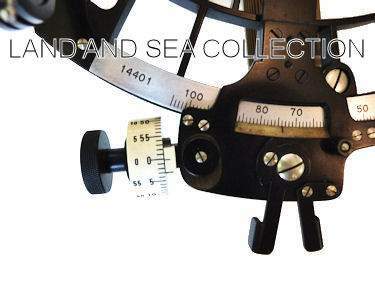 CONDITION SEXTANT: This instrument is in remarkably fine condition considering its 75 year age. It has no index or side error. The index arm and the micrometer wheel work smoothly. The micrometer wheel is calibrated from right to left or clockwise and counter clockwise in one second intervals from “0“ to plus and minus 1 minute. The shades are perfect. All markings are sharp and distinct. 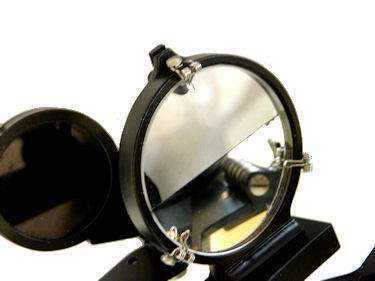 The index mirror has one pin size black spot, and the horizon mirror has a few very narrow black marks only along its top and bottom vertical edge, both of which are only mentioned for the sake of completeness. In the original design, a small lamp was fitted on a pedestal on the lower index arm above the viewing port. It was removed earlier. The hollow handle has a cavity for close to a “D“ size battery. As noted, the artificial horizon attachment has been replaced by the factory with three horizon shades or filters for marine astro-navigation. 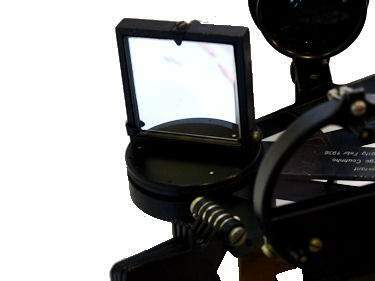 Since this is an aluminum frame sextant, there is some very minor pitting which is primarily on the back of the index mirror frame and on the sextant's back as seen in the image below. There are a few light Grey spots, all of which are of no consequence. There is no inspection certificate, but instruments of this generation rarely had non-adjustable instrument error of more than 20 arc seconds, which for all practical purposes, may be considered free of error for practical use. 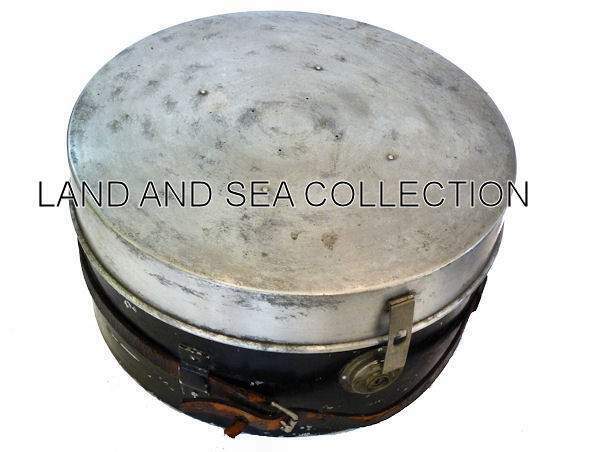 CONDITION - ALUMINUM CASE: This case is original to the sextant and is in good usable condition with all its original tools, comprised of a special adjustment wrench, screwdriver, brush, and small container of grease present. There was a rectangular plaque mounted on its top which is missing and the leather strap around its girth is broken. The two movable aluminum arms clip into the two locks. We did not test them. PROVENANCE: Two copies of Customs Application, Form 4455 of October, 1937, for use when an article leaves the United States, and is intended to be brought back was filled in, but never executed. The owner of this sextant was stated as Arthur F. Hucht who obtained it at the Port of Baltimore from Edward Kinsky, a seaman. We obtained it in the normal course of business, and was told the administrator of an Annapolis, MD estate represented the Hucht family in its sale. 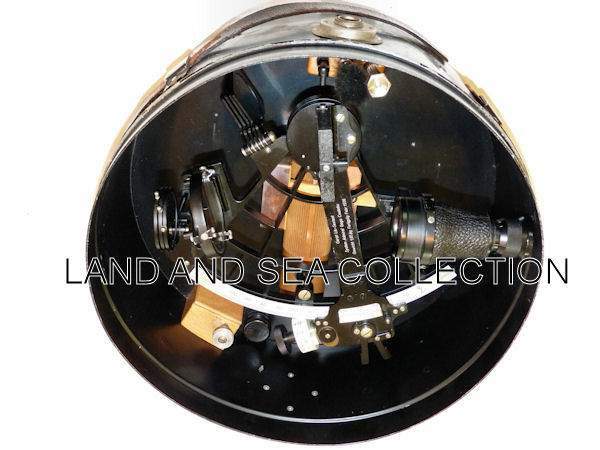 The forms will be included with the sextant. 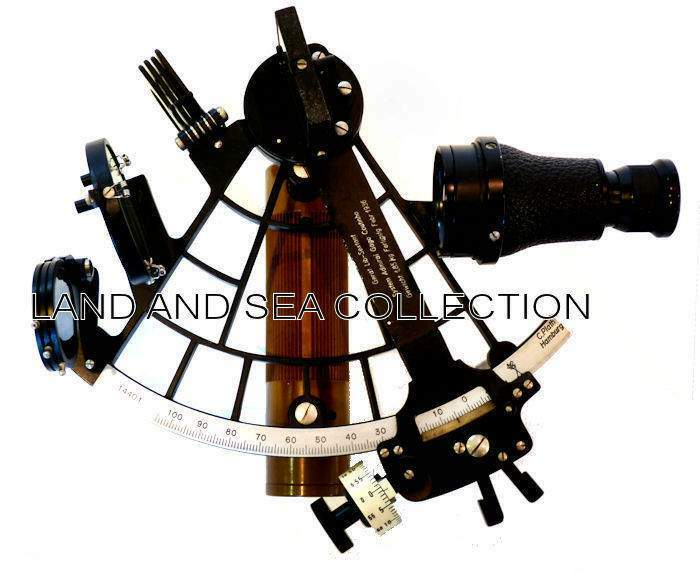 CONTEMPORARY ARTIFICIAL HORIZON: Pictured below is this sextant fitted with a C. Plath Bubble Horizon made around 1955. This device has the ability to change the size of the bubble which was discontinued in follow-on versions. Unfortunately, it is not in working condition, and shown for illustration only. It is not included in this offer. HISTORY OF THE COUTINHO SEXTANT: After World War One ended, the pioneer aviators of Europe and North America, were challenged by the task of making long distance flights across oceans. This required the development of a means of establishing an artificial horizon from an aircraft since at altitude the earth's horizon could not be used. Preceding Lindberg's Trans Atlantic flight and the Dole Race from San Francisco to Honolulu both by eight years, what may be the most important pioneering oceanic flight was made by two famous Portuguese aviators, Sacadura Cabral, pilot, and Admiral Gago Coutinho, navigator, in 1919. They flew 11 and one half hours from Cape Verde Islands to Rio de Janeiro using an artificial horizon sextant designed by Admiral Coutinho. The design was based on two spirit level tubes – one to keep the sextant horizontal and the other to keep the sextant vertical. The Portuguese Navy, who owned the rights to the design, contracted with the German firm of C. Plath of Hamburg, Germany for the production of this instrument. Plath's first instrument was tested on a flight in 1927 of the Dornier-Wal flying boat, Argos, from Lisbon to Rio de Janeiro using only astro-navigation by Captain Jorge Castilho. In 1929, Captain Wittenman navigated the Graf Zeppelin around the world using a Coutinho sextant. With this spectacular record, the design was introduced at the 1930 Berlin Air Show. It was used primarily by Lufthansa and just prior to WW II, Air France acquired a few of them. 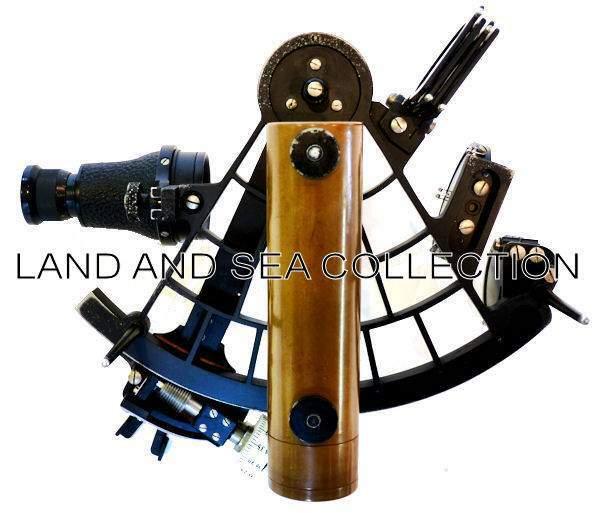 We do not know how many of these sextants were made, but in our thirty some odd years of using celestial navigation at sea and being in the sextant business, this is the only one that we have seen outside a book. Frame: Aluminum with black enamel paint. Micrometer Drum. No vernier Scale: reads to one minute of arc. Index Mirror: 46 x 45 mm. aluminized on front side. 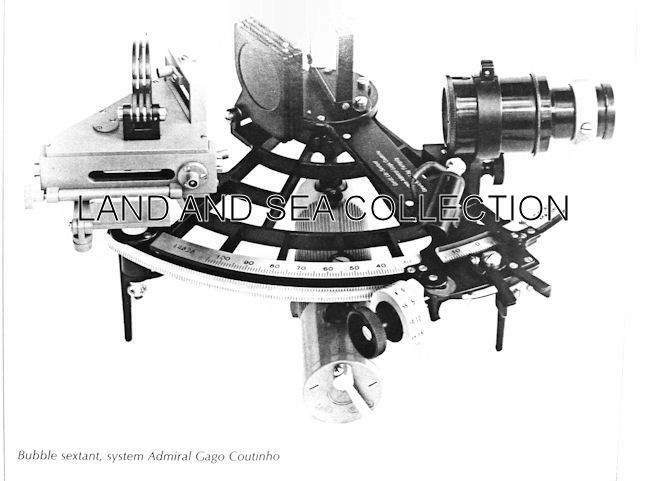 C. PLATH COMPANY HISTORY: In brief, Carl Plath started manufacturing sextants, in addition to other nautical products, in Hamburg Germany in 1862 though the company's origin dates back to 1837. As a result WW II, C.Plath was dismantled completely by the occupation forces. Around 1950, various prohibitions were lifted, and C. Plath was allowed to begin production again of sextants and other nautical instruments. Also in 1949,C.Plath was offered a gyrocompass patent and in 1951 the first gyrocompass designed to this patent was presented to the public. C.Plath progressed from the role of instrument maker to that of a modern marine navigation equipment manufacturer. In the following years the product range was expanded by many more modern designs such as autopilots, speed logs, radio direction finders, etc. OUR UNCONDITIONAL NO NONSENSE GUARANTEE: If not completely satisfied with your purchase it may be returned within five days of receipt in its original packaging if without damage. Return items must be insured for their full value. Only a prior email authorization from us for the return is required. Shipping charges are included in this offer if an error is due to our fault within the Continental United States. .
International buyers welcome, but should inquire first. We have satisfied customers in Argentina, Australia, Austria, Belgium, Bermuda, British Virgin Islands, Canada, Chile, China, Czech Republic, Democratic Republic of Congo, Denmark, Estonia, England, France, Germany, Greece, Holland, Hong Kong, Hungary, Iceland, Indonesia, Ireland, Israel, Italy, Japan, Kuwait, Latvia, Malaysia, Martinique, Mexico, Nigeria, New Zealand, Norway, Nova Scotia, Panama, Poland, Portugal, Puerto Rico, Romania, Saudi Arabia, Scotland, Singapore, Spain, St. Maarten, South Africa, Sweden, Switzerland, Thailand, Turkey, United Arab Emirates, USVI and the Eastern Caribbean. Copyright 2011 by Land And Sea Collection™. All Rights Reserved.